“Cartoons make us laugh. Without them, our lives would be much sadder. Cartooning for Peace is an international network of committed press cartoonists, who fight with humour for the respect of cultures and freedoms. Cartooning for Peace is an organization founded after an event and a meeting. The bloody reactions to the publication of the Mohamed cartoons in Danish newspaper, Jyllands-Posten on September 30, 2005 led to the founding meeting of twelve international cartoonists on October 16, 2006, gathered together by Kofi Annan, Nobel Peace Prize and United Nations Secretary General and editorial cartoonist Plantu, from French newspaper Le Monde, for a seminar on “Unlearning Intolerance”. Cartooning for Peace defends fundamental freedoms and democracy. Our organisation is particularly eager to exert freedom of expression as it is defined in article 19 of the Universal Declaration of Human Rights: “Everyone has the right to freedom of opinion and expression; this right includes freedom to hold opinions without interference and to seek, receive and impart information and ideas through any media and regardless of frontiers”. Cartooning for Peace is attached to the respect for pluralism of cultures and opinions. In the events we organize, exhibitions, publications and international meetings, we are mindful to show the diversity of cartoonists’ perspectives on a given subject. Cartooning for Peace fights against prejudice and intellectual conformism. Towards extremism, we denounce the excesses, we mock the false certainties, counteract odium and strive to dismount impostures. Cartooning for Peace is respectful in disrespect. We do not seek to humiliate the beliefs and opinions. We circumvent interdicts with humour. Cartooning for Peace takes into account the risk that a cartoon published on the Web can appear out of context, within seconds, in every corner of the globe. Our organization is vigilant to prevent press cartoon from becoming an aggravating factor of conflicts. Cartooning for Peace offers editorial content. Convinced that cartoonists often foretell acutely before everyone, the stirrings of society which will make news tomorrow, we strive to bring forward debates that our societies are not even yet aware of. Cartooning for Peace allows cartoonists to interact with each other and to confront their different ideological opinions. Our network provides visibility and support for those who are unable to work freely or whose freedom is threatened. Cartooning for Peace uses the educational value of press cartoon to denounce intolerances. Our organization gives young people a voice and raises their awareness on major societal problems. Cartooning for Peace brings press cartoon closer to the public. We organize meetings between cartoonists and the public, and set up thematic exhibitions showing a critical look of society. We also publish press cartoons, in paper or digital form. Cartooning for Peace is a tool serving freedom of expression: a forum and a meeting place for all those who challenge intolerance and all forms of dogmatism. 1991 – 1992 – Plantu meets Yasser Arafat in 1991 and Shimon Pérès in 1992, and makes them successively sign the same cartoon. For the first time, the signatures from both sides appear on the same document, one year before the Oslo agreements. The meeting is filmed and the video receives the Rare Document Prize at the Festival of the Scoop of Angers. The Reuters agency defines the meeting as “Cartoons’s diplomacy”. 2005 – The case of the cartoons depicting the prophet Mohammed: one part of the world heats up after the publication of 12 drawings from Danish cartoonists, depicting Mohammed, in the Danish newspaper, Jyllands-Posten. Fifty people die in the riots in Pakistan, and eleven in Libya. 2006 – On October 16th, 2016, at the UN headquarters in New York, Kofi Annan (the then UN secretary-general) and Plantu set up a seminar called “Unlearning intolerance”. Twelve famous international editorial cartoonists meet to think about the editorial responsibility of published cartoons. The first exhibition “Cartooning for Peace” is born there. 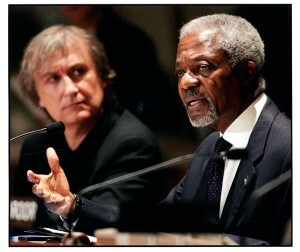 The Cartooning for Peace Swiss Foundation is then created in Geneva with Kofi Annan as Honorary President. Two years later, in 2008, in Paris, the French Association Cartooning for Peace was born. Its headquarters are located at the newspaper Le Monde where Plantu, the President of the Foundation and of the Association, works. 2007 – 2nd Cartooning for Peace exhibition at the Palais des Nations in Geneva, and then at the Ministry of Culture in Paris, Rome and Atlanta. 2008 – First meeting of editorial cartoonists and exhibition in Israel and Palestine (Jerusalem, Ramallah and Bethlehem). It’s once again the occasion to generate dialogue between Palestinian and Israeli cartoonists. 2010 – Cartooning for Peace and the Caen Memorial launch the first permanent exhibition of the association thanks to the support of the Mutuelle Générale de l’Education Nationale (MGEN). The book “Foutez-nous la paix” (“Leave us alone”, Editions Beaux-Arts) is published for the occasion. In the same year, Cartooning for Peace presents its first exhibition in Latin America, in Bogota. 2011 – The Cartooning for Peace Swiss Foundation holds its first exhibition on the shores of Lake Geneva and creates the International Editorial Cartoon Award presented by Kofi Annan. 2012 – Cartooning for Peace creates the first International Editorial Cartoons Festival in Montpellier, in partnership with the General Council of Hérault and the Montpellier Press Club. In December, the French daily newspaper Le Monde creates the page “Je te fais un dessin” (“I make you a drawing”). 2013 – Cartooning for Peace produces its first traveling educational exhibition about editorial cartoon and freedom of speech: “Cartoons for Peace” (« Dessins pour la Paix »). 2014 – Radu Mihaileanu and Stéphanie Valloatto direct the movie “Cartoonists – Footsoldiers of Democracy” about twelve cartoonists from Cartooning for Peace. The film is presented at the Cannes Film Festival 2014, in the presence of the twelve protagonists and the Cartooning for Peace team. 2015 – Attack against the editors of Charlie Hebdo. Among the twelve victims were the editorial cartoonists Wolinski, Charb, Cabu, Tignous and Honoré. Cartooning for Peace organizes a grand international seminar on press cartoon and freedom of speech: “Press cartoons: a state of affairs”. On December 15 and 16, with the support of the European Union, Cartooning for Peace gathers 28 cartoonists, each one representing a member State of the EU, for the event “Cartooning for Human rights”, two days of meetings, exhibition and debates inside the European Parliament. 2016 – The opening of “This is not Europe!”, co-produced with the Mons Memorial Museum, took place in Mons on February, with 52 editorial cartoonists from 27 different countries shared drawn opinions on Europe in a major exhibition . For four months, the audience was invited to reflect on their own views of Europe and European identity crisis. On the occasion of the World Press Freedom Day and the presentation of the 2016 International Editorial Cartoons Prize, an open-air exhibition was displayed along the banks of the Lake Geneva until June 4th, 2016. Cartooning for Peace and Dinard City Hall present a wide-ranging retrospective “Cartoons for Peace” exhibition. It was curated by the French cartoonist Plantu and Jacques Terrière with almost 200 cartoons from 58 cartoonists. From November 18th to December 16th, the French Institute in Moscow was presenting the exhibition “Cartooning for Human Rights” at the Contemporary Art Center Winzavod. The project aimed to bring together the work of 28 European about the necessity of protecting human rights. 2017 – The beginning of the program “Draw peace and democracy”, supported by the European Union. Through education to medias and citizenship of young people, this programme explores in nine countries such as Morocco, Palestine, Israel, Tunisia, Burkina Faso, Ivory Coast, Brazil, Mexico and Canada, the opportunities to promote a peace culture and democracy through press cartoons. Cartooning for Peace and Editions Gallimard collaborated once again to publish a collection of albums dedicated to editorial cartoons. Each thematic 120-page book is prefaced by an expert and explores a subject of topical interest through sixty editorial cartoons from all over the world. A new one about Emmanuel Macron was released on the 12th of October. Organized every two years in Ivory Coast, Cocobulles, international festival of press cartoons and comics in Grand-Bassam, gathers cartoonists from the entire world in order to offer 3 days of exhibitions, workshops, conferences, meetings, movies projections and signing sessions. Grand-Bassam then becomes the comics and press cartoons capital city by celebrating the ninth art in all its dimensions. The exhibition “Connecting people – Cartoons for peaceful coexistence” was released with 80 editorial cartoons from all around the world about 6 thematics. For the 60th anniversary of the Treaty of Rome, Cartooning for Peace and the European Commission shows a new exhibition “Decoding the stars” on the founding fathers of Europe and challenges the continent is now facing. 2018 – While the frigate Hermione is completing its “Libres ensemble” sailing tour in Bordeaux, in partnership with the Organisation Internationale de la Francophonie, Cartooning for Peace is not missing the call and offers the general public to discover its latest pedagogical exhibition “All Migrants !“as well as an exceptional conference within Sud-Ouest newspaper editorial office!